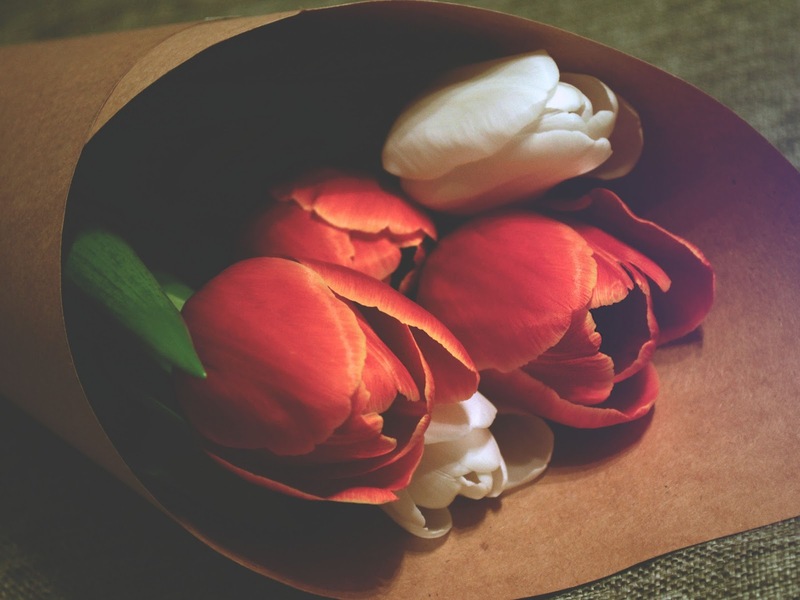 Mother's Day is right around the corner and I want to share some of my fave gifts with you. None of my picks are expensive, but they are thoughtful and say you care. Some of my favorite Mother's Days were sent on a sandbar in Lewes, Delaware, when my children were young. 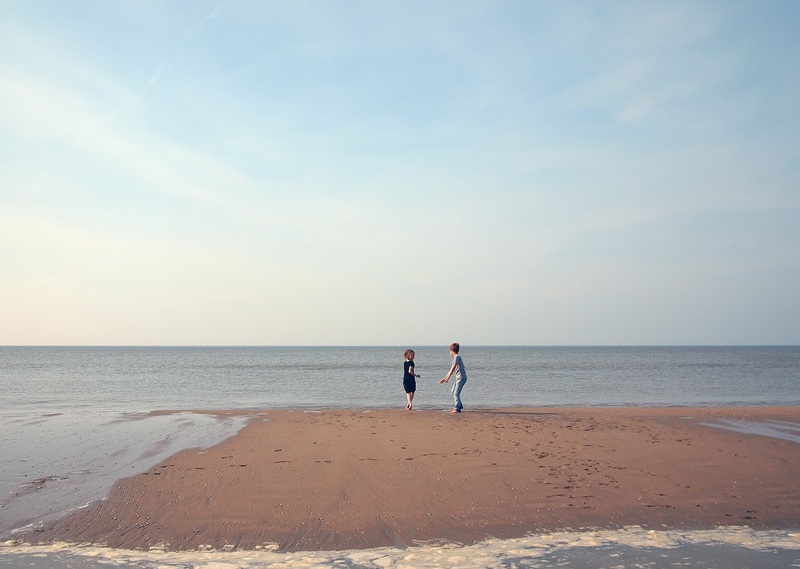 We would walk through the water and look for sea creatures and shells. Sometimes if it was an especially warm May day we would bring our beach chairs and a picnic lunch and enjoy sitting on our little island in the bay. We didn't do any thing expensive, but we had plain old fun. The important thing is to send time with your family and do something everyone enjoys. Create a memory this Mother's Day! This month's Were All Ear's challenge is this... use the EGG as your Muse in whatever form you would like. 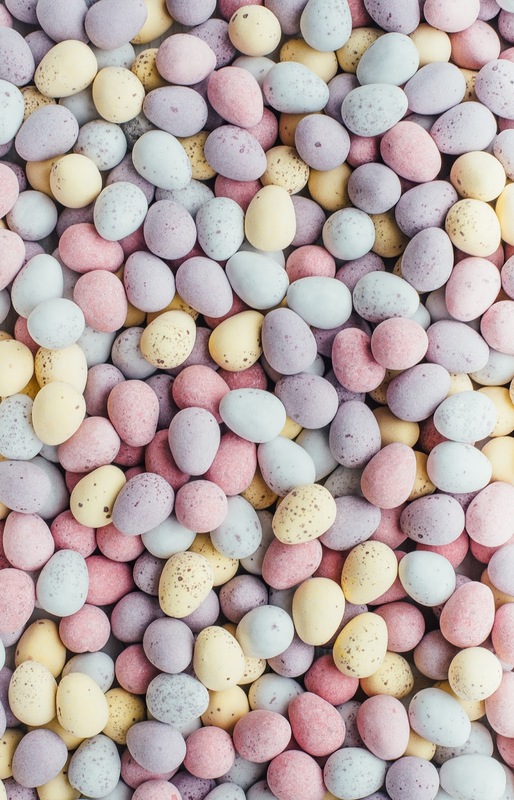 You can pick the rainbow colors that you remember as a child. 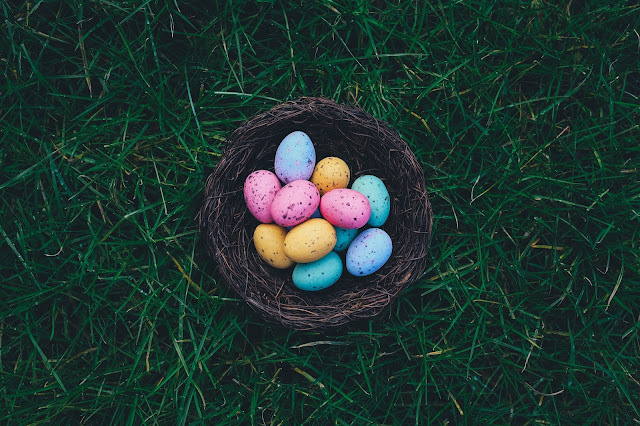 You can stick to more natural egg imagery as a sign of life and rebirth and the continuance of nature awakening in the spring. 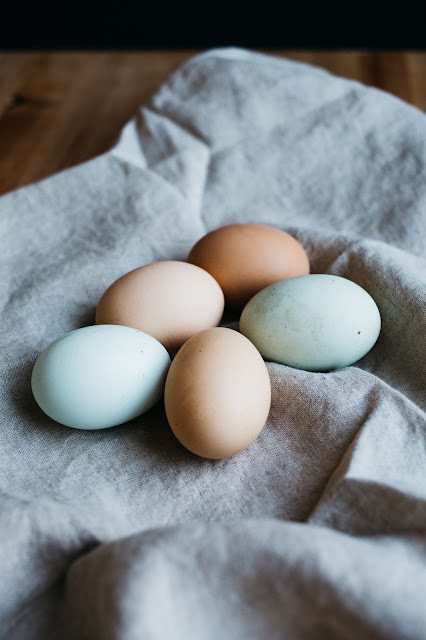 You can just use a simple egg shape. There are so many options. Well what did I decide to do? 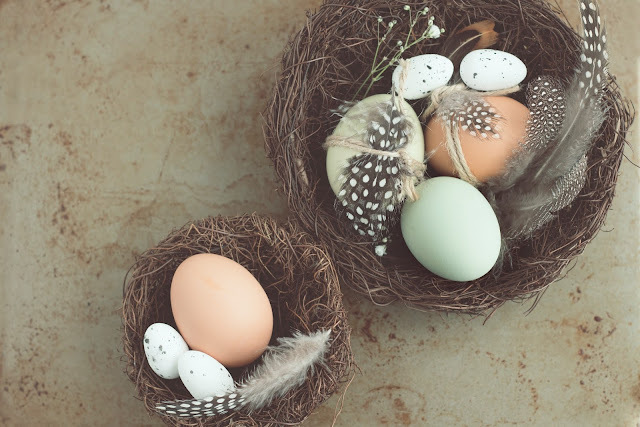 I was inspired by the eggs in the spring that are found in birds' nests. I found these cute birds made by Vintaj. I got out my natural brass wire and some vintage glass pearls that I made the birds nests with the pearls in them. I decided to use the vintage pearls because I like their beige color rather than a stark white. The most difficult part was figuring how many jump rings to use to get the birds to hang at the right spot and in the right direction. 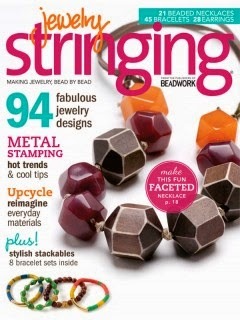 I do want to make a pair of nests with sterling silver wire. 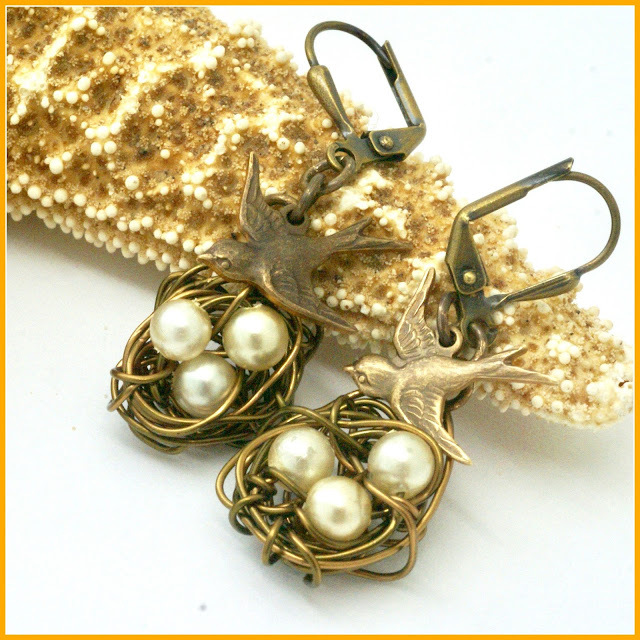 For the silver nests, I am going to use white pearls. This was my first attempt in making nests and I am pleased with the results. There are lots of tutorial on the Internet. I really enjoyed making them. I plan to make nest more now. They are great accents in necklaces. I love an article that I read about using nests made into pins as baby shower favors. I thought that was a really cute idea and I am filing that idea away for further use. If you need a special gift for Mother's Day or a new mom, these earrings are available in my online shop. This was a fun challenge for me. This month's Art Bead Scene Challenge is a colorful and vibrant landscape by Gauguin. Gauguin found it constricting to do what other Impressionists did and paint entirely from nature. Instead, he created a new type of Impressionism by painting with large, outlined blocks of flat, bright color. One thing that separated Paul Gauguin from other artists was that he used heavy outlines in his paintings. Impressionists blended pieces together to achieve a sense of time in the painting. Gauguin separated out objects with clear outlines instead in watered down Prussian blue. Later the blue outlines would be filled in with opaque colors. The idea was for the dark outline to heighten the intensity of the other colors used. 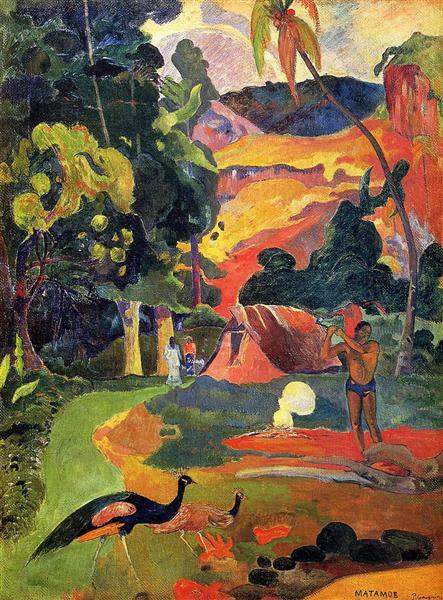 Gauguin used flat areas of bright color. He used colors such as Prussian blue, cobalt blue, emerald green, viridian, cadmium yellow, chrome yellow, red ochre, cobalt violet, and lead or zinc white. I decided to limit my use of colors to blue, black, green, and yellow. The ceramic leaf that I selected to use as my focal in a necklace is by the well know ceramic artist Mary Harding and it reminded me of the blues and blacks in some of the trees in the painting. I love the earthy and rustic looks of her work and I have several pieces in my shop that have her ceramics in them. This earthy navy blue ceramic necklace is perfect for anyone who loves art jewelry. The dagger necklace has a rustic appearance and reminds me of the many green, and orange colors found in nature especially in Spring. 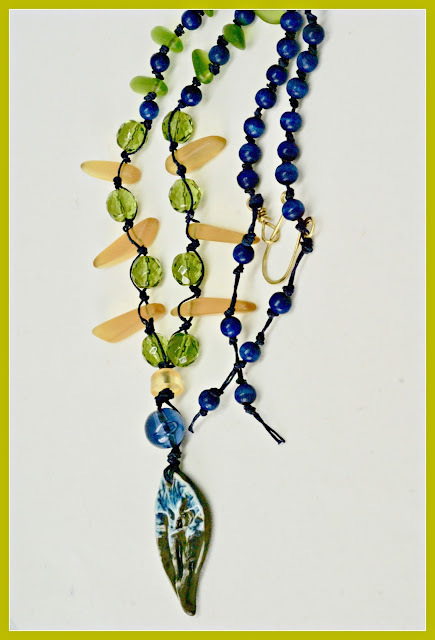 I used navy blue Irish waxed linen thread to bring out the yellows and greens in the necklace. This long boho necklace has a bronze clasp that I made for this necklace. I was inspired by this piece. I think it would be a great Mother's Day gift. What do you think? 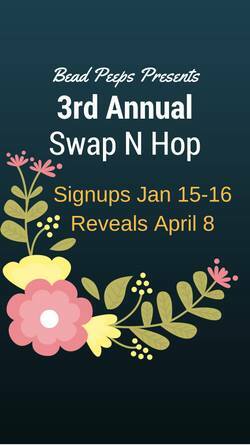 I am happy to say I am part of the 3rd Annual Bead Peeps Swap N Hop which is hosted by Linda Anderson of CherryOnTopDesign. Our directions for this event are to send our partner something he or she will love and will brightening his or her day as well as offer a challenge. We didn't have much time to mail our beads to our partner. 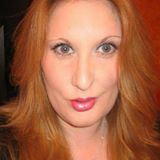 I spent some time poking around on the Internet to learn a little about my partner--Linda Raggo as possible. Linda lives in Auburn, Georgia. I found that Linda is exclusively on Facebook. She told me that she has had much better luck there than Etsy or Amazon Handmade and better than her local shows. She is a seller in the LBA Designers Galleria Showcase group. I had the opportunity to watch her sell there one weekend. As far as I could tell, she sold everything she listed. Her photos of her jewelry were really well done. Her jewelry is beautiful. 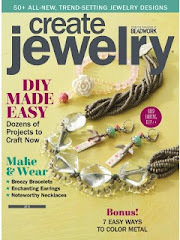 She uses Swarovski crystal accents, sterling silver and lots of handmade ceramic and lamp work by well known artisans. 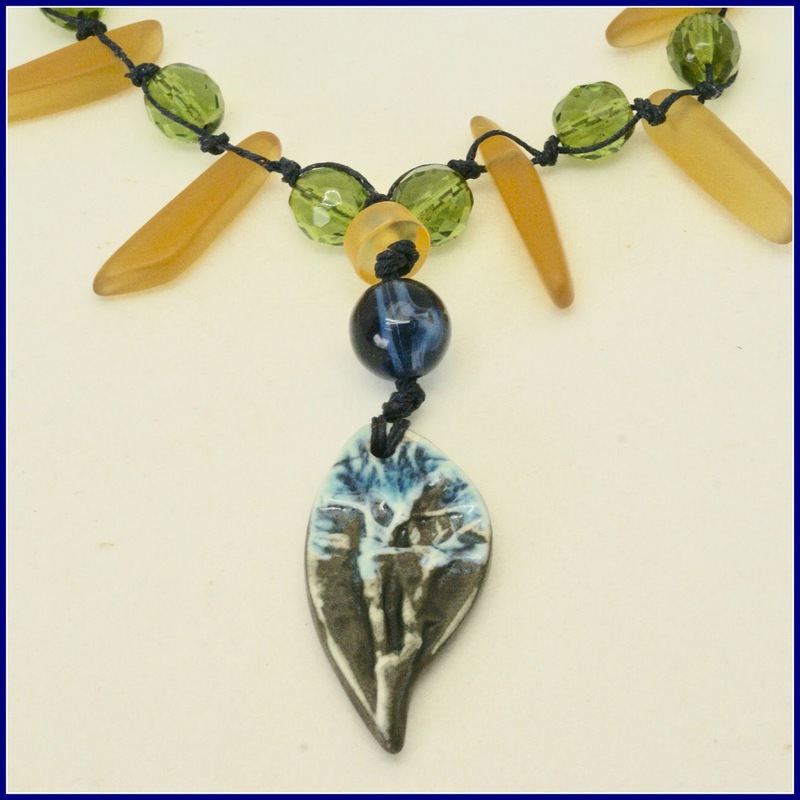 This yellow, moss green, and brown agate necklace has the three creamy leaf shaped ceramics that Linda sent to me. I added light brown jasper and moss green and brown agate to them. 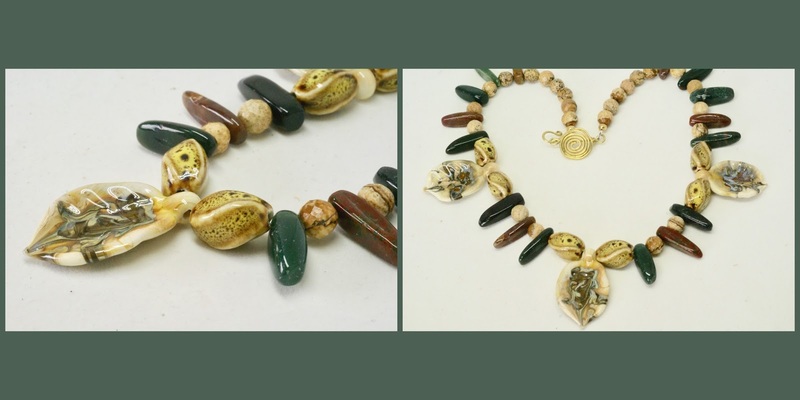 This earthy statement necklace is 18 inches around. I made the brass clasp which reminds me of the sun. The yellow, brown and green colors are perfect for the nature lover. I think this woodsy necklace would make a special Mother's Day necklace or handmade artisan gift for someone special. It is available in my shop. 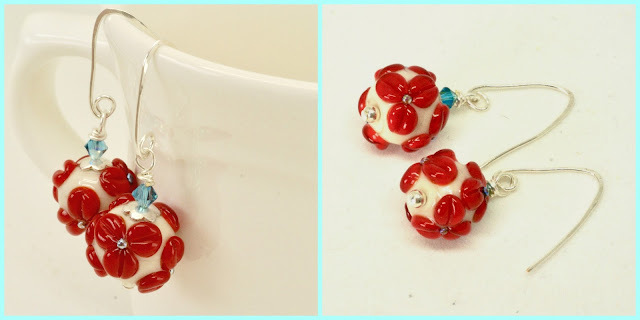 These red floral lampwork earrings are so romantic and pretty! 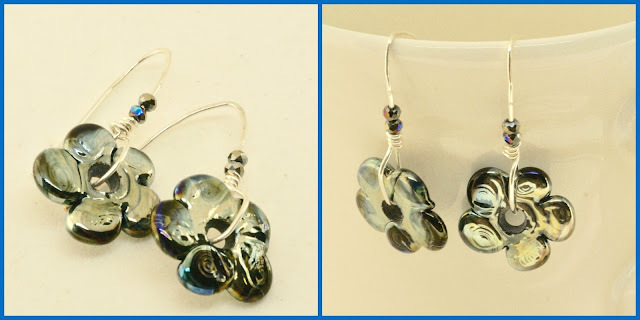 I used the floral lampwork beads that Linda sent. 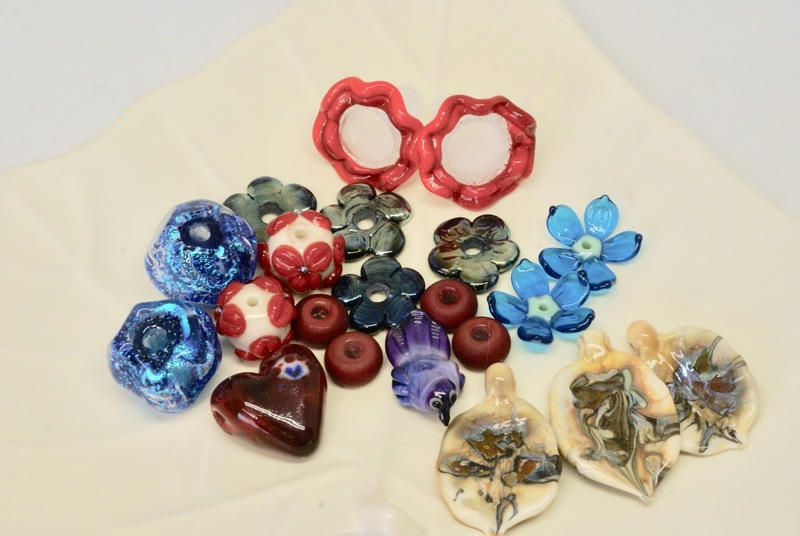 The glass beads are white with red flowers that have tiny blue centers. I added blue swarovski crystals to highlight the blue in this red jewelry. I hand forged the sterling silver ear wires. 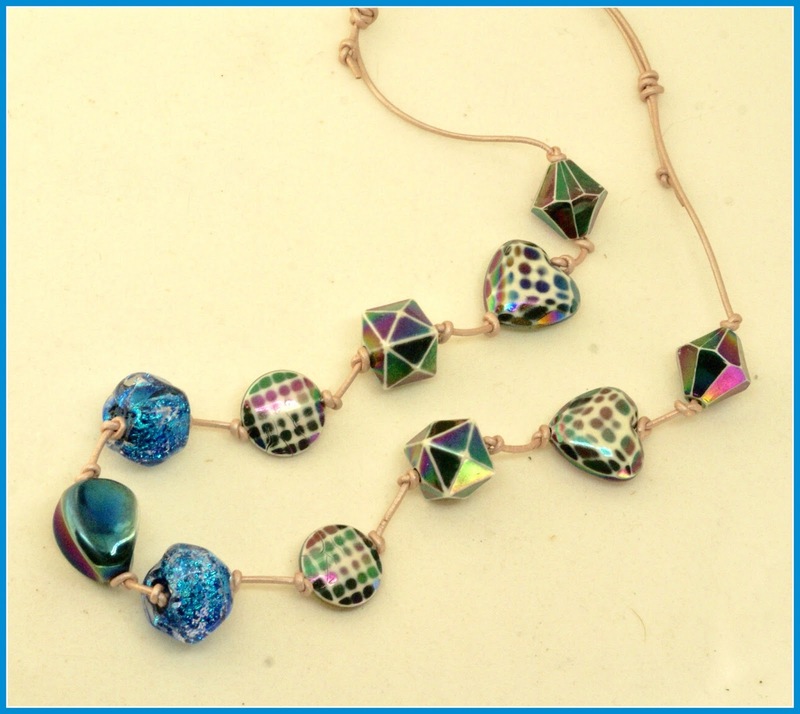 This rainbow colored casual necklace is a multicolored necklace with upcycled vintage tin beads and the stunning large, royal blue glass beads that Linda sent me. I attached them with soft pale pink leather. I made an adjustable necklace which can be worn short or long. I used the irredescent blue floral beads in these earrings. The floral lamp work is a pretty navy blue. The earrings have hand forged sterling silver ear wires that I made especially for this jewelry. I added a couple of crystals to the ear wires for some sparkle. 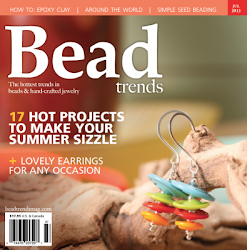 Part of this challenge involved sending our partner some beads that we created with. I sent Linda the pink ceramic focal. I am anxious to see if she used it and how. Below is the pink crystal necklace that I made with it. 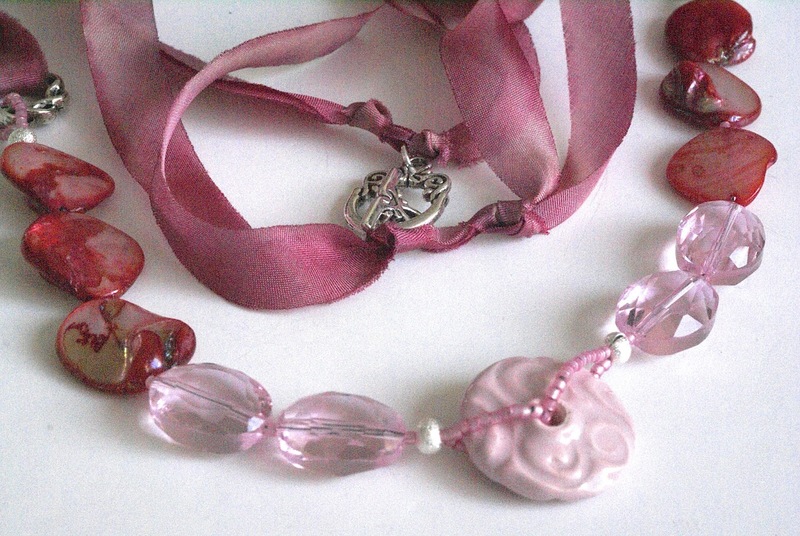 This rosy red necklace has a pale pink ceramic focal surrounded by stunning pink crystals. There are rosy red pearls and silk ribbon attached. The crystal necklace has a pretty floral silver clasp. 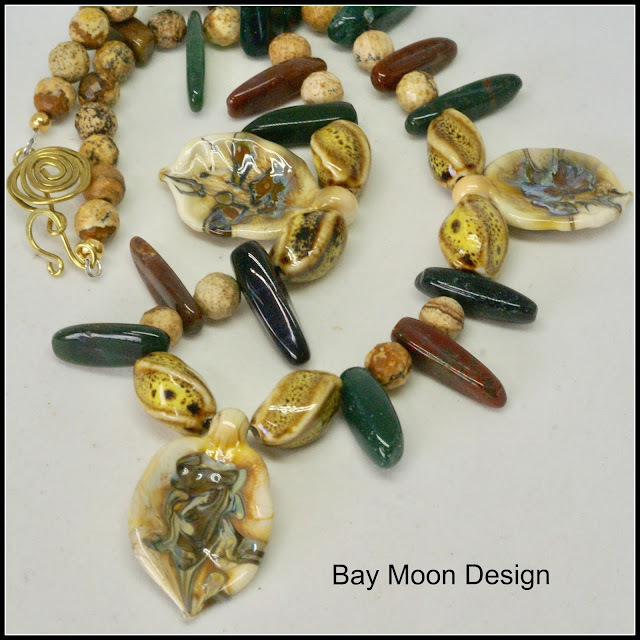 The other bead that I sent to Linda is the ocean wave bead in the necklace above. I used the artisan 24 mm. in diameter ocean wave lamp work bead by glass bead maker Carole Hughes. 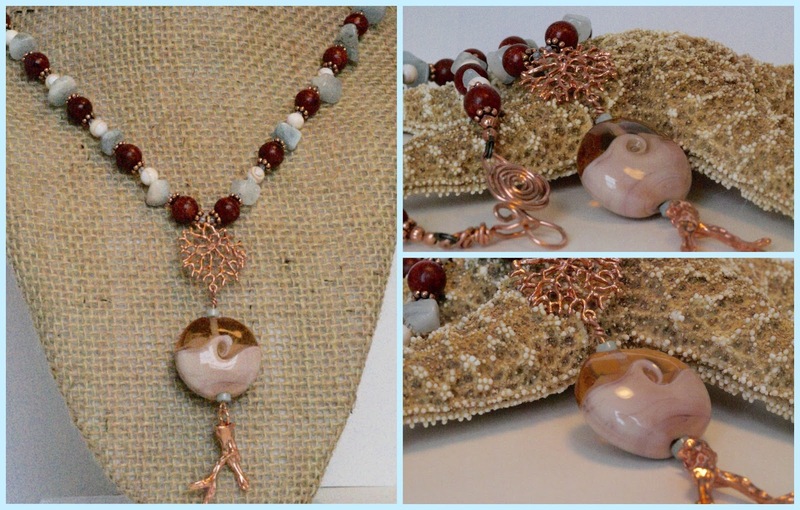 The peach colored seashell swirl opaque glass and transparent glass reminds me of an ocean wave. I added a copper coral connector to the top and copper coral branch to the bottom of the lamp work. I combined copper spacers, carnelian red beads, cream beads, and blue gray chips. I also added tiny blue gray seed beads to add color and sparkle. I made the circular copper clasp with the intent of adding more copper with a similar design to the piece. 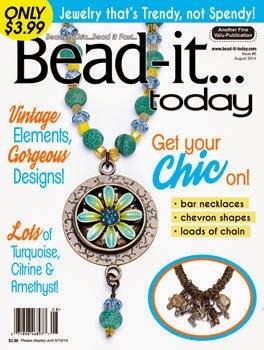 I am anxious to see if Linda used these beads and what she did with them. I still have lots of beads that Linda sent left to use. Thank you Linda Raggo for the generous supply of beads and Linda Anderson for organizing this. Please grab your favorite beverage and enjoy seeing what everyone has created. Leave a comment or two!